This is a close up view of the console of the historic 4 manual, 52 rank pipe organ of 144 stops, 3,859 pipes, built for the Scottish Rite Cathedral in Saint Louis, Missouri, by the W.W. Kimball Company of Chicago. This is a fully expressive machine equipped with electro-pneumatic action in which the Choir division is subordinate to the Swell, and the Echo is a floating division playable from any manual singly or any 2 manuals at a time. Charles M. Courboin, the famous Belgian organ virtuoso, served as tonal consultant for this as well as many other important instruments. Built during the Roaring Twenties before the development of amplified sound, this organ was supplied with Antiphonal and Echo voices placed far from the main pipe chamber to provide a "surround-sound experience." It incorporates some very imitative orchestral voices, beautiful foundation stops and celestes, colorful flutes, a separate 8-rank string chorus with soft Dulce Mixture and 2 Vox Humanas on separate tremulants, a few other theatre-style stops, a number of traps and tuned orchestral percussion sounds, certain special effects, and 5 very big high pressure reeds. The console is situated in the auditorium on an elevated second floor choir balcony, House Left (Stage Right). To the left of the console and behind a tone grill situated high in the wall will be found most of the 128 swell shades (shutters) in the instrument. The main pipe chamber is located behind these shades. This chamber is shaped appropriately for Masonic use, i.e. like an oblong square, rectangular in layout, and houses most of the organ's tonal forces (42 of the instrument's 52 ranks are situated there). After a trip up a very long flight of stairs one enters the main chamber through a door situated at one end of this rectangle. The swell shades and tone grill occupy the entire left side of this rectangle, with the other 3 sides bounded by interior concrete walls. This pipe chamber is divided into upper and lower halves. Upon entering the lower half at floor level on one end of the rectangle one immediately notices a full-sized Kimball upright piano electrically connected to the console and situated just to the left and only one step inside the door. To the right side of the walking path will be found the metal pipes of the 16' octave of the Great Waldhorn which are situated on a waist-high elevated platform. Just past the Waldhorn pipes, on the right at floor level, will be found the air reservoir for the Pedal Bombarde, and directly opposite, on the left side, some of the instrument's traps, percussions, and special effects are situated, with the swell shades and tone grill directly behind them. The pipes and passageboards of the Great and Choir are positioned up a ladder on the upper level above the piano and percussions. A few steps further into the chamber, looking upward on the right, reveals the bottoms of the the 16' pipes of the Pedal Open Wood positioned on the upper level. Further back on the right one finds the Pedal Bombarde pipes all lined up against the far right concrete wall. Deeper straight into the chamber and to the right at floor level will be found the blower room and the ladder to the Swell passageboards and pipes. The Solo pipes, percussions, and passageboard occupy the deepest part of this chamber at floor level on the left and sit about 2 feet off the floor. Here the 25 bars of the Solo Chimes hang directly in front of the swell shades and the glockenspiel occupies the interior wall on the opposite side. This Solo division today is situated behind an access door not original with Kimball which may be kept open or closed. The blower is situated in a small wooden walk-in room at the deepest part of this chamber on the right at floor level. This also has an access door which is typically kept closed to help muffle its noise. The original relay, which was removed in the 2011-2014 renovation, was situated here on the lower level just to the left and in front of the blower room. Above the blower and Solo pipes on the upper level will be found all the pipes of the Swell, the largest division in the organ. The Pedal Bombarde pipes are all mounted vertically close to or against the right side concrete wall. The smaller of these are of metal and are situated in a very high elevated position. The largest pipes are made of wood, situated at floor level, and increase in height the closer they get to the blower room. Since this chamber is only 28 feet high and the resonators of these pipes are all full length, the 4 lowest wooden pipes of the 32-foot extension are mitered at their feet in order to squeeze into the available vertical space. These pipes are reached for tuning by means of 2 end-to-end ladders situated closeby. The longest metal pipes of the 16' octave of the Swell Horn Diapason and Viole are mounted vertically but mitered at their tops near the ceiling due to space requirements. The 12 wooden pipes of the bottom octave of the Pedal Contra Bourdon are spatially positioned very close to the largest pipes of the Swell Tibia Clausa in order to provide the strongest differential 64' tone when they sound together a perfect 5th apart. These 12 pipes are all mounted horizontally against the far rear concrete wall. The metal pipes of the 16' octave of the Solo Cello are also stacked horizontally against the interior wall of the Solo and near the floor, just below the glockenspiel. The Antiphonal chamber is located above the second floor orchestra balcony, House Right (Stage Left), behind another identical tone grill situated high in the wall about 160 feet from the console. This chamber is accessed through a small hinged door built into the wall of an adjoining room. The rarely seen Echo pipes are situated in a small chamber midway in the ceiling about 60 feet above the floor of the auditorium. These voices speak through a smaller tone grill which is part of the ceiling and may only be accessed from the outside roof of the building 50 feet above the height of the main chamber, by opening a locked exterior door to the attic, and walking a long passageboard and up a ladder to the door of the chamber. The term "organ crawl" refers to a visit by a group of tourists to an important instrument. It is understood in a figurative sense only, and is very different from what a trained technician must do to gain access to each and every functioning part of the instrument by means of ladders, passageboards, and squeezing through small and sometimes tightly constricted spaces to conduct routine maintenance, repairs, regulating, or tuning. Technicians can sometimes find themselves working temporarily in poor light, standing with all their weight on one leg, or perhaps stretching or leaning off balance to find a certain pipe. There are also electrical issues to consider. It therefore goes without saying that making a literal crawl like this through a pipe chamber requires knowledge, experience, a certain level of physical fitness, strength, good balance, and sometimes acrobatic skill to keep from getting shocked or slipping and taking a tumble which could cause serious injury. Working inside a pipe chamber in any organ can be risky even for experienced technicians, thus, for safety reasons, it's always best to keep the uninitiated out of the chamber. Wind pressures in this organ are high. Most of the instrument (including the Great Tromba), save for 10 special ranks, speaks on 10 inches of wind; the Swell Vox Humana and all of the Echo pipes are on 7-1/2 inches, the Great Harmonic Trumpet is on 15 inches, both Solo Tubas are on 20 inches, and the Pedal Bombarde is on 25 inches. At absolute full throttle with all 5 of these high pressure reeds drawn and coupled, this organ, while already huge, speaks with the power of a far bigger instrument. Under these conditions with all swell shades wide open the effect is ear-splitting and unpleasant in the extreme. A ministering art of performance is therefore required when drawing its stops and operating its swell shoes, much more so than one might expect. With 100 per cent of its tonal forces expressive from top to bottom the decibel gain possible when operating the Master Swell Lock is in fact many times greater than one can expect to find in the typical, partly expressive church organ. Gentle opening of this shoe from the closed position is all it takes to bring the sound a good bit closer. When this incredible machine was being constructed American organ building was going through a phase at the time which deemphasized the inclusion of independent upperwork in the scheme with the idea that the instrument's tonal structure would not suffer provided that the remaining stops were voiced with very high harmonic development. Concert organs in those days were designed to blend with a symphony orchestra without swamping the instrumentalists. This led to the creation of a limited number of organs like this one, instruments voiced on higher wind pressures which had striking individual effects but a dark sounding ensemble. Not surprisingly, this type of organ was particularly well suited to rendering the organ parts of orchestral scores, performing solo transcriptions of orchestral works, and taking an entire symphonic score upon its shoulders when necessary [See menu bar, Photos 3, subpage Development & Design]. Courboin, its tonal designer, made a career of performing such transcriptions. Organists seated at this instrument therefore get the sense that they're not just playing an organ -- they're conducting a full symphony orchestra. Save for the Pedal, Antiphonal Pedal, and Antiphonal Great, each division is supplied with its own separate tremulant. The Swell and Echo Voxes are on their own separate vibratos, and the Swell is equipped with a separate Tibia Clausa tremolo and separate tremolos operating at 2 speeds (fast, slow) for its string-toned stops. This allows this organ to produce endless varieties of subtle effects of light and shade which can be infinitely nuanced by means of coupling and adjusting the swell shades. At the same time this an "8-foot organ," meaning that all of its upperwork (with one exception -- the Swell Dulce Mixture) are derived by unification, i.e. by lengthening the wind chests to accommodate extensions of its 8-foot ranks and using this extended compass to derive more stops at other pitches all of the same quality and strength of tone. With just about all of its Pedal stops wired to play manual extensions this permits an awful lot of organ to be packaged behind a system of swell shades. It's therefore very easy -- when we sit down to an instrument with this much tonal and dynamic spread and this much power, where the temptation to "play out" must be resisted at every turn -- to overthink registrations and, if we're not very careful, to end up blasting. The temptation to overdo it this way has to be guarded against continually. Courboin, the tonal designer of this organ, chose a major Bach work to open both of his dedication recitals. This presented an extraordinary situation for him, as there is no independent principal chorus w/mixture anywhere in the instrument. Since the entire effect of a major Bach organ work depends upon its plenum sound and the clarity of its moving lines, Courboin drew the stops and couplers in such a way as to arrive at the most transparent (least opaque) "synthetic chorus" this instrument can produce to best imitate the plenum sound which Bach knew. To do this the instrument's flute stops at 4', 2-2/3' and 2' pitch and the Swell Dulce Mixture would have been drawn; any bright secondary diapasons (Great English Diapason, Swell Horn Diapason, Antiphonal Diapason) would also be drawn along with the 4' English Diapason and perhaps the Great Waldhorn and some of the tamer reeds with good blending qualities such as the Swell Oboe Horn, Antiphonal Tuba Horn, and Echo Cor D'Amore. In an organ supplied with an independent principal chorus on the main manual these tamer reeds would not take part in the Bach plenum, but in this organ they provide much needed harmonic upper partial tones, adding luster and definition for this type of music. Any strongly imitative stops with poor blending qualities, any tubby-sounding tibias and diapasons, both Solo Tubas, and the Pedal "noisemakers" (Gravissima and Contra Bombarde) would, of course, remain retired. The result might then be further brightened with octave coupling, according to taste. On this organ, this same registration, or something close to it, would be used for the performance of all fugues -- Baroque, Romantic, Modern, or Contemporary. For passages where this organ is called upon to produce its fullest sound the Swell Oboe Horn and Posaune ranks along with the Solo Cello could be added [See menu bar, Photos III, Combinations] -- here the tone of the Cello is not absorbed by the Posaune, as it is voiced so brightly that it almost sounds like another reed. Beyond this, the reeds of the Great and the Pedal 16' Bombarde may be added, with due caution. Playing on the real McCoy like this also can teach things that electronic substitutes cannot. The manual keys of this organ, for the time being, have lighter spring tension due to there being only one set of brushes per key instead of two, a situation which came about during renovation and has yet to be restored to original condition -- thus, at the present time, less finger pressure is needed to make electrical contact. When that contact is made, it closes a circuit which sends an electrical signal to a small electromagnet, one of thousands in the instrument, to open. This allows pressurized air to enter a wind chest through a very small opening, and the pressure differential causes a leather pneumatic within the wind chest to collapse, thus pulling open the pallet below the pipe and permitting the pressurized air to enter it. When the manual keys are so easy to depress like this the slightest touch of a neighboring key may cause strange, unwanted notes to sound. For example, a shirt with French cuffs might accidentally cause this to happen if the cuffs accidentally touch the keys of a lower manual while the organist is playing above it. This has been a frequent lament among guest organists, especially those who may be more used to playing on mechanical action organs with more heavily weighted keyboards. The contract to build this organ, which was signed in December, 1923 -- 10 years before AGO standards for console measurements were codified -- called for "Pedals, A.G.O. pattern, corrected scale, concave and radiating." 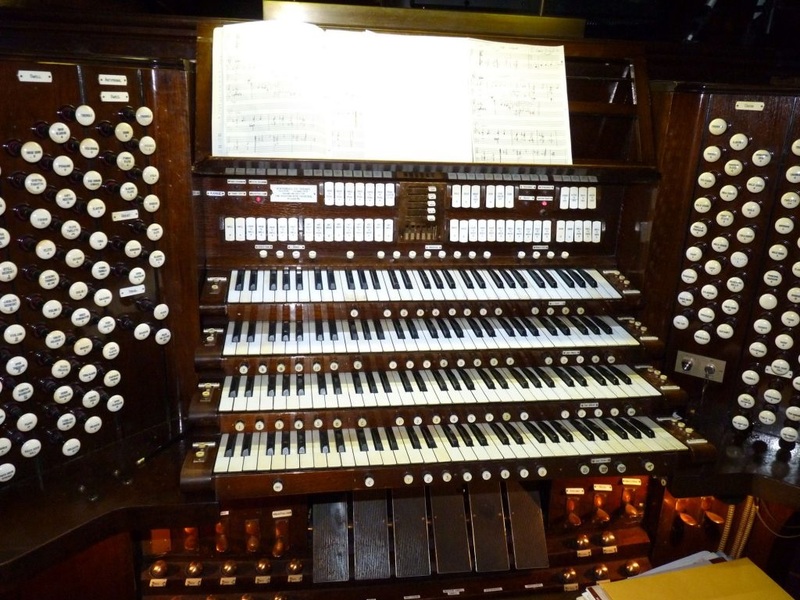 The 1924 pedalboard of this organ is built on a larger radius of curvature than the maximum permissible within these codified standards (the standard radiation specifies an 8-foot 6-inch radius, which is minimum, with 9-foot 6-inches being the maximum permissible). This difference is noticeable, particularly when playing a double pedal where both feet are playing at the extreme ends of the pedalboard at the same time. In this situation the organist used to AGO standards will need to make a conscious effort to stretch the feet further apart to reach the keys, or mistakes will result. Also, pipe organ pedal keys are typically equipped with 2 springs, one at each end, whereas electronic organ pedals generally have only one spring usually located under the heelboard. When playing this organ's pedals, organists used to practicing on electronic organs may notice a little greater resistance and perhaps a deeper key fall than that to which they've become accustomed. Because of the shadow thrown by the overhead lighting of the console rack, most organists find the row of 8 general pistons ("typewriter" pistons) centered above the Solo manual easier to see and, consequently, easier to operate than the others which lie between the manuals. To minimize any distracting, unwanted accidents with strange notes it's also important to remember, when using this instrument and those like it, to keep its stops retired (with the General Cancel piston engaged) until the moment it's time to play and be very "sure-fingered" and "sure-footed" when we do. Such minor little concerns are a far, very far cry from the crude, uncontrollable, noisy affair found in the medieval cathedrals and abbeys of Europe of a thousand years ago. We are dealing here with a marvel of art and science of a type and quality we are not likely to ever see again in electro-pneumatic organ building -- an instrument with the capacity to barely whisper one moment with a sound that' almost inaudible and roar the next with a clobbering power sufficient to crack a diamond. Between these 2 extremes there is an ocean of dynamic possibility and an endless mix of timbres. This instrument speaks into an auditorium bounded on 2 sides by tone grills and plaster walls, a huge stage curtain hanging from a 97-foot long proscenium on a third side, 3 thousand upholstered seats on the fourth side, a largely wooden ceiling, and a wall-to-wall carpeted floor, all of which are non-reflective, sound-absorbing materials. The acoustics are thus very dry with virtually no "bounce." Since the organist must also play the building this means that, on this organ, the moving notes in Bach's music should not be played broken but imperceivably broken, i.e., using a clean legato ("almost legato") touch. The written values of rests between notes and chords in the score must also be shortened more than what is written on the page, holding those notes and chords a bit longer than written. Failure to do this may cause repeated chords written with a reverberant space in mind to sound clipped, even comic. In acoustical situations like this one, some performers also elect to adopt an acoustical release with any big closing chords in spread harmony for both hands and pedal which some feel provides a better "bloom" to the sound at the moment the keys are released. This decision has to do with artistic interpretation and depends upon the personal taste of the performer. Organists are all wired differently. A certain world class organist who is no longer with us who also happened to be a builder, and in reference to this instrument, once made this remark to this author at a lesson: "There are organists out there who would kill, literally, for the chance to play [regularly] on a Kimball." Meant in a metaphorical sense only, this profound observation is indicative of the quality of Kimball workmanship. Back in the 1920's this company employed some of the finest craftsmen, technicians, and pipe voicers in the world, and they were paid the highest salaries in the industry, at the time, for their craftsmanship. In spite of this, we organists -- poor souls -- we never know on any given day or evening what will be in tune with our pipe organ, what may not be working, or what kind of ambient air conditions may await us (such as a hot day with high humidity), all of which changes the response of the instrument. But we also know this: After we experiment with it enough to develop an awareness for the balance needed between providing enough organ to support the singing without going overboard and at the same time to combine the stops with dynamic control in a way that displays their true beauty, the major challenge in working with this wonderful machine will have been met and overcome. And that's all the wonder of music.